It's not often I find a book so good that I think about it when I'm not reading it. 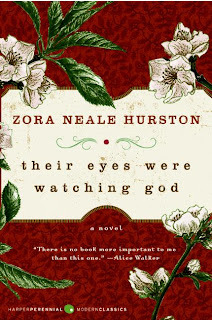 Their Eyes Were Watching God by Zora Heale Hurston is one of those books. 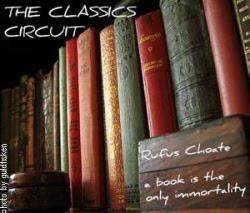 I knew of the book because of Oprah and even watched the TV movie but until The Classics Circuit never considered reading the book. I'm so glad I finally did. Janie had a fairly happy childhood being raised by her grandmother. However, after Janie is caught kissing a boy, her grandmother marries her off to a farmer out of fear that Janie needs protecting. For Janie this is an unhappy situation. She is looking for true love and life on a farm hauling manure isn't the place to find it. Then one day Joe Sparks walks down the road and offers her a better life. Janie takes the opportunity. She soon discovers that she's just traded one life of drudgery for another. Joe sets himself up as the mayor of the new town of Eatonville and as an important man, he expects certain behaviour from his wife. That is to say Joe wants meekness and gentility. Janie finds the pressure to bend to his will crushing and over the years she loses a part of her soul. When Joe dies, Janie feels free and at first attempts to hide her feelings from the judgmental townspeople. Suddenly single men from everywhere turn up at her door telling her, "Uh woman by herself is uh pitiful thing." But as Janie points out to her friend Pheoby, they just want to marry her bank account. Janie enjoys her freedom until a younger man named Tea Cake shows her how to live. Janie no longer hides behind a facade of false grief which shocks the whole town. They are even more disapproving when she runs off with Tea Cake. Written in 1937 this is a surprisingly modern piece of women's fiction. Their Eyes Were Watching God was unappreciated, to say the least, by her contemporaries. To the black male writers Hurston's writing wasn't serious enough. They just didn't get it. Maybe this is because Hurston was a woman writing a woman's story and like it or not a woman's story is just not the same as a man's. It wasn't until Alice Walker wrote an article about Hurston in the 70s that the masses discovered just what a great writer she was. Ships at a distance have every man's wish on board. For some they come in with the tide. For others they sail forever in the horizon, never out of sight, never landing until the Watcher turns his eyes away in resignation, his dreams mocked to death by Time. That is the life of men. It's the kind of writing you can sink right down into. Hurston creates an atmosphere where you feel that Florida is the only place in the world, that nowhere else exists. You see the pear tree, hear the bees, experience the hurricane. What I liked the most about the book was how Janie finally starts to please herself after 20 years of marriage to a bully. She doesn't let the ideals of the townspeople, who think they know what's best for her, dictate her life. They think they know Janie but all they know is the person Joe wanted them to see. That wasn't the real Janie. I thought it was funny how they blamed this new behaviour on Tea Cake, like she couldn't make any decisions for herself. Afterall she was 'just a woman'. Even though times have changed, some things stay the same. When Janie hooks up with Tea Cake, the people of Eatonville are shocked. "She's 'way too old for a boy like Tea Cake." People still make a big deal about an older woman with a younger man. They call them Cougars like they are predators and make fun of them on TV and in movies. Meanwhile, old Hugh Hefner prances around with girls old enough to be his granddaughters and everyone treats him like a stud. I'm actually glad to have just read Their Eyes Are Watching God at this point in my life. Since Janie and I are near the same age. I wonder what I would have thought of it 10 or more years ago. I can appreciate Janie's desire to please herself and not let other people's opinions matter to her. I'm starting to care less about what other people think, although it is hard to let go of those old habits. While Their Eyes Were Watching God might have been dismissed when it was written, it is certainly is being appreciated now. This would make an excellent selection for The Woman Unbound challenge or a book club pick. There is so much to discuss in this book. There is also a Zora Neale Hurston website. Thank you to the Classics Circuit for the opportunity to review this book. Please visit the Classics Circuit blog for more books on the Harlem Renaissance. I really need to read this book. We used to live in Auburn, which is close to Notasulga, Hurston's birthplace. I went through Notasulga and saw where she'd lived, but have yet to read the book. Shame on me! I have been meaning to read this for what seems like forever. I thought about picking it up for the Harlem Renaissance tour too. Thank you for confirming that I really need to get this into my list of books read. I read this book a long time ago and really loved it. I think I might need to get it off the shelf for another read. This one has been popping up on my radar with increasing regularity. It's probably a sign that it's time to finally get to it! I listened to this a couple of years ago and loved it! Ruby Dee did an outstanding job reading. oh, what a BEAUTIFUL review! I agree wholeheartedly with you about how the prose was just so wonderful, so lyrical. This book, I have to admit, was the best surprise of my reading last year. I loved it. One think that strikes me interesting is that little mention is made of her choice or not to be a mother. Or at least, I haven't done much research on it, but that stands out to me. I almost picked this up at Halk-Priced Books on Friday, but resisted. I wish I had read your awesome review first!!! I can honestly say that this was a life-changing book for me. I read it when I was 17, and it is forever imprinted in my mind. Who else writes like this? Hurston is amazing. Isn't Hurston a gorgeous writer? I read this back in high school and the story of Janie and Tea Cake has certainly stuck with me. I'm so glad you enjoyed this book. Do you think you'll be picking up more Hurston? Kathy- I hope you do pick it up. Michelle- I think you'd enjoy it. Amy- It's definitely one to read more than once. Lisa- It is a sign! Joann- Must have been nice to listen to it. Care- Yes, I thought about that too. I know when she is first married, Nanny asks her if she is pregnant. Then later with Joe, I think they stop sleeping together after awhile. Still, it could have happened. Hurston must have done this on purpose because it would have changed things had she had a child. Bookshelf- Both 17 & her late 30s were such important ages for her. I wonder what I would have thought of it then. April- If I can find some, I will. I've really got to revisit this book! It sounds so good. Although I have listened to the audiobook, I think something is missing when I don't read the dialect. Hey, thanks for letting me talk you in to joining the Circuit. I'm glad you enjoyed the book so much! I have this earmarked for next month. I'm really looking forward to it now. I adore this book and have had the pleasure of teaching it in a few English courses. Janie is such an intriguing and inspiring character while simultaneously being flawed. There was so much controversy over this book in part because a focus of the Renaissance was to promote African-Americans, and it was believed that showing them as less than perfect in books was detrimental to the cause. I am sooo happy that writers like Hurston and Nugent did not agree with this sentiment. LOVE this book! It's one of my all-time favorites, and I've enjoyed many of her short stories as well. They all seem to have a really strong female lead who finds her strength in the face of an iffy relationship. "Sweat" and "The Golden Six Bits" are fantastic. I also read this one recently...right around Valentine's Day...so when I thought of sweethearts, I thought of Janie and Tea Cake. I wanted to write a review, but am pretty star-struck by its wonderfulness. Guess I'll just refer my readers to you!